World 2-3 (Chapter 2-3 in Yume Kōjō: Doki Doki Panic; titled Stay Cool! or The End of the World of Deserts!) is the third level of World 2 in Super Mario Bros. 2. If the player plays as Luigi, there is a cave right at the beginning of the level, that only Luigi can jump high enough to get to, that leads to a Magical Potion and a bunch of coins. The rest of the level is not too different from its two predecessors. The difference is that, once inside the pyramid, the chosen character must first fall through a hole. After landing on the first ledge, there is a Magical Potion that leads the player to a Yoshi Egg in Super Mario Advance. 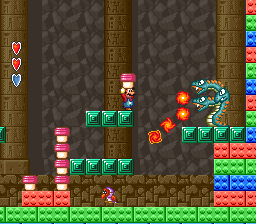 The player should then dig to the bottom to find a key that open the door showing the path that leads to the world's boss, Tryclyde. The first one is to the right of the first cactus. The second coin is above the cactus before the second sand pit. The third coin is in the left drop lane. The fourth coin is to left of the door that leads to the key. The last coin is directly above the Panser. The first egg is to the right of the ladder near the vegetables. The second egg is on the ledge where the Magical Potion is. ↑ Nintendo Power Volume 1, page 24. ↑ Super Mario Bros. 2 Inside Out, Part I. Page 18. This page was last edited on April 6, 2019, at 14:50.